Sharon Valerii was born on the colony of Troy in 2351. During her childhood her parents Katherine and Abraham Valerii died in an accident killing all the members on the mining colony. After the death of her parents she ended up on Earth where she finished growing up. 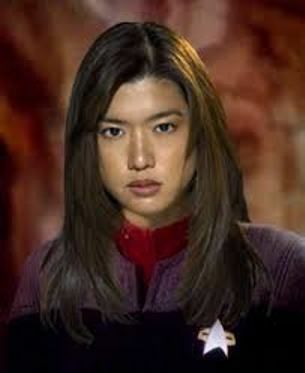 At the age of seventeen she entered Starfleet Academy with the intent of becoming a pilot. It had been her dream to be a fighter pilot like in the old days but Starfleet did not have specialized fighter pilots. Her first assignment was aboard the Defiant class USS Ajax where she served for four and a half years seeing action in the Dominion War. It was after the battle of Cardassia when the helm officer was injured and she took over the helm that led to her getting transferred to another Defiant class vessel the USS Washington to be the Assistant Chief Helm Officer. In 2379, she was assigned to the USS Odyssey to be the Chief Helm Officer putting her on a substantially larger ship than she was used to piloting.